The publisher behind the sixth main entry to the Guitar Hero franchise has unleashed its full track list today, containing more than 90 songs from rock music's pantheon of legendary guitar shredding bands. When Guitar Hero: Warriors of Rock ships on September 28, gamers will be able to jam to revered rock songs such as Neil Young's political-infused "Rockin' In The Free World" and Twisted Sister's defiant "We're Not Gonna Take It". Continuing the series tradition, the game contains several artists from among the best of heavy metal for those rockers with a penchant for headbanging. This time around featured heavy metal bands include Slipknot, Dragonforce, Metallica, Pantera, Megadeth and more. * A Perfect Circle - "The Outsider"
* AFI - "Dancing Through Sunday"
* Alice Cooper - "No More Mr. Nice Guy"
* Alter Bridge - "Ties That Bind"
* Anberlin - "The Feel Good Drag"
* Arch Enemy - "Nemesis"
* Avenged Sevenfold - "Bat Country"
* Bad Brains - "Re-Ignition (Live)"
* Band Of Skulls - "I Know What I Am"
* Black Sabbath - "Children Of The Grave"
* Blind Melon - "Tones Of Home"
* Blue Oyster Cult - "Burnin' For You"
* Buzzcocks - "What Do I Get?" * Children Of Bodom - "If You Want Peace... Prepare For War"
* Creedence Clearwater Revival - "Fortunate Son"
* The Cure - "Fascination Street"
* Deep Purple - "Burn"
* Def Leppard - "Pour Some Sugar On Me (Live)"
* The Dillinger Escape Plan - "Setting Fire To Sleeping Giants"
* Dire Straits - "Money For Nothing"
* DragonForce - "Fury of the Storm"
* Drowning Pool - "Bodies"
* Edgar Winter- "Free Ride"
* Fall Out Boy - "Dance, Dance"
* Five Finger Death Punch - "Hard To See"
* Foo Fighters - "No Way Back"
* Foreigner - "Feels Like The First Time"
* George Thorogood and The Destroyers - "Move It On Over (Live)"
* The Hives - "Tick Tick Boom"
* Interpol - "Slow Hands"
* Jane's Addiction - "Been Caught Stealing"
* Jethro Tull - "Aqualung"
* John 5 - "Black Widow Of La Porte"
* KISS - "Love Gun"
* Linkin Park - "Bleed It Out"
* Lynyrd Skynyrd - "Call Me The Breeze (Live)"
* Megadeth - "Sudden Death"
* Megadeth - "Holy Wars... The Punishment Due"
* Megadeth - "This Day We Fight!" * Metallica & Ozzy Osbourne - "Paranoid (Live)"
* My Chemical Romance - "I'm Not Okay (I Promise)"
* Neil Young - "Rockin' In The Free World"
* Nickelback - "How You Remind Me"
* Night Ranger - "(You Can Still) Rock In America"
* Nine Inch Nails - "Wish"
* The Offspring - "Self Esteem"
* Pantera - "I'm Broken"
* Poison - "Unskinny Bop"
* Queen - "Bohemian Rhapsody"
* Queensryche - "Jet City Woman"
* Rammstein - "Waidmanns Heil"
* The Ramones - "Theme From Spiderman"
* Red Rider - "Lunatic Fringe"
* R.E.M. - "Losing My Religion"
* Rise Against - "Savior"
* The Rolling Stones - "Stray Cat Blues"
* The Runaways - "Cherry Bomb"
* Rush - "2112 Pt. 1 - Overture"
* Rush - "2112 Pt. 2 - The Temples Of Syrinx"
* Rush - "2112 Pt. 3 - Discovery"
* Rush - "2112 Pt. 4 - Presentation"
* Rush - "2112 Pt. 5 - Oracle: The Dream"
* Rush - "2112 Pt. 6 - Soliloquy"
* Rush - "2112 Pt. 7 - Grand Finale"
* RX Bandits - "It's Only Another Parsec..."
* Silversun Pickups - "There's No Secrets This Year"
* Slash featuring Ian Astbury - "Ghost"
* Slayer - "Chemical Warfare"
* Soundgarden - "Black Rain"
* Stone Temple Pilots - "Interstate Love Song"
* Strung Out - "Calling"
* Sum 41 - "Motivation"
* Tesla - "Modern Day Cowboy"
* Them Crooked Vultures - "Scumbag Blues"
* Third Eye Blind - "Graduate"
* Tom Petty & The Heartbreakers - "Listen To Her Heart"
* Twisted Sister - "We're Not Gonna Take It"
* The Vines - "Get Free"
* The White Stripes - "Seven Nation Army"
* ZZ Top - "Sharp Dressed Man (Live)"
"We engaged our fans to find out what they really wanted and then hand-picked over 90 tracks that deliver the ultimate rock experience," said Tim Riley, Vice President of Music Affairs for Guitar Hero. Taking a story-driven approach, Guitar Hero: Warriors of Rock features a deep Quest Mode that has your band journey to a world populated with Demi-Gods and Beasts. The music voyage will introduce you to eight Guitar Hero characters that must band together to become the ultimate rock warriors capable of taking down "The Beast" and saving rock 'n roll. The story mode will be narrated to the players by Gene Simmons from KISS. Guitar Hero: Warriors of Rock also features a brand new guitar controller that was inspired by the game’s unique art style and over-the-top story that players will experience in Quest Mode. The streamlined controller has all essential parts contained with the neck, allowing removable ‘wings’ to be replaced with alternatives, giving gamers the chance to tailor the guitar controller to their own unique styles. 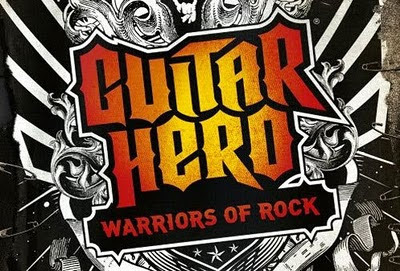 Guitar Hero: Warriors of Rock will be available for the Xbox 360, PlayStation 3 and Wii.